Death Note finally gets the proper Blu-ray treatment! Consider the typical shonen anime villain—suave, charismatic, usually a high-functioning psychopath, the fate of the world is only at stake because this guy decided he wanted it on a platter. Yeah, maybe there's a sealed-up monster in there somewhere, or giant robots or a deadly artifact of untold power, but it still all usually comes down to a guy with stylish hair and a super-evil plan. Yet, while most of these villains (and the spiky-headed heroes who oppose them) tend to cash in on their ambitions with swords, lasers and/or improbable martial artistry, Death Note's battles involve...detective work. And a notebook. Also, that villain? He's the main character. 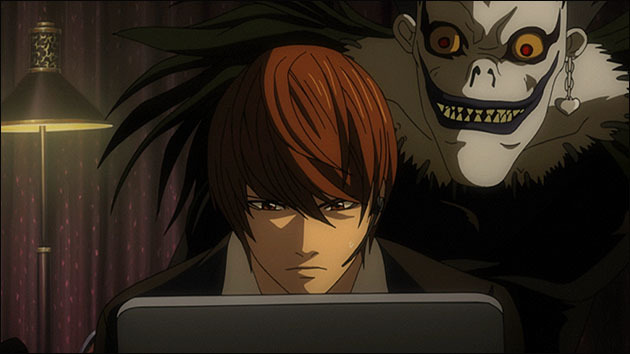 First published in Japan back in December 2003, Death Note told the story of troubled genius Light Yagami and his quest to purge the world of criminals while staying one step ahead of a mysterious detective known only as L. Death Note became an instant hit, even spawning an anime that began airing only five months after its final chapter ended. 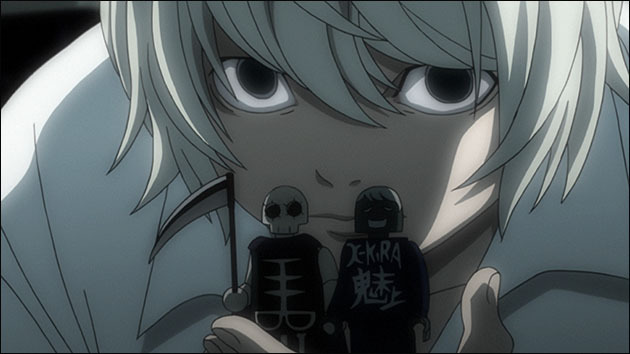 Now, almost ten years later, that anime has been re-released in a single set—Death Note: The Omega Edition. Consisting of both the original 37-episode run and two Death Note: Relight movies, this special set contains everything anime ever made for Death Note in beautiful Blu-ray quality. Now, for the uninitiated who've only, say, heard the name, seen the wall scrolls and/or heard the squeals of the fans, Death Note seems like yet another popular series that everyone keeps talking about. In addition to the anime and the original manga, there's been a series of live-action movies in 2006, a live-action televised miniseries in 2015 and now Warner Bros. just cast Nat Wolff as Light in an upcoming American adaptation. That's a lot going on, which can lead to some pretty serious oh-come-on-it-can't-be-that-good vibes. Yet while that's understandable, I can assure you from the bottom of my own jaded, cynical heart that, yes, the story, characters and art are really that good. Some plot-context: like many other anime, Death Note begins in a high school. 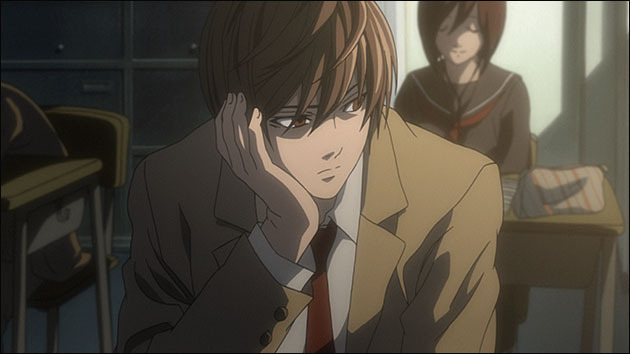 Light Yagami may be Japan's highest-testing Student, a former tennis prodigy and an "amateur" sleuth whose resume would put most pros to shame…but he's bored out of his mind. At least until a notebook falls from the sky. Inside are instructions explaining that if you write down a human's real name with their face in mind, that human will die, either by a default heart attack or by some other means written thereafter. Light's skeptical at first, but after trying it out on a couple criminals anyway, he discovers its powers are real. 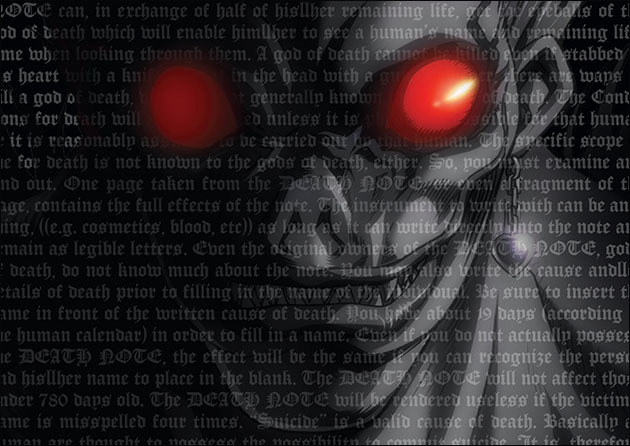 Feeling that he's found his true purpose in life, Light decides to use the Death Note's powers to rid the world of criminals, ruling the world as an undisputed god from the shadows. Glad to know we're being rational! The rest of the world has a somewhat different reaction, however, as various criminals begin to die of freak heart attacks all over the world. Exactly as planned, the populace begins whispering rumors of the godlike "Kira" (killer) who's dealing justice to evildoers. Some are happy, most are scared, but one man shows up amid the clamor: L, a detective whose name is not known and whose face has never been publicly seen. Between observations and a few clever ploys, L uncovers several of Kira's methods right off the bat…but Light's also not about to forgive someone who dares threaten his perfect world after he's just started getting the reactions he'd wanted. That, of course, is just the starting premise; from there the story becomes an all-out battle of wits and maneuvers, with L finding more and more ways to analyze Kira while Light dodges the investigation attempts as he schemes to uncover L's true identity. And somehow, all of this starts awesome and stays awesome without a single explosion in sight. Light's ability to manipulate almost any given situation to his advantage is equal only to the inventive ways he uses and hides the Death Note and its pages, creating some VERY slick surprises. Meanwhile, L has a budget big enough to fund a small country, plenty of gadgets and spy gear, and his crazy-competent assistant Watari. To say nothing of his near-prophetic deductive skills. And wow, was this a massive trip down memory lane! 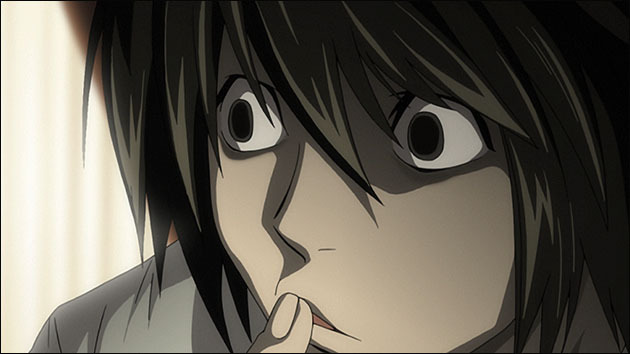 My own first experience with the Death Note anime had been on broadcast TV, meaning that I'd have to wait a whole week for the next episode; re-watching the entire set back-to-back makes it WAAAAY easier to follow the twisty plot and complex plans everyone's making against everyone else! It's almost a relief when Light or L takes a few minutes to explain their plans and gloat over how well they worked—otherwise I'd need to do A LOT of detective work just to keep up! Even remembering the overall plot, I still found myself surprised and mystified by the inventive ways and solutions each character employs as he or she tries to say ahead of the others. Also, Light's got a fascinating character arc; among other things, it explains just how a normal person might begin acting like the archetypal manga villain. Indeed, what's truly scary about him is just how seamless his transition from bored-but-moral high school student into delusional executioner becomes. It's downright horrifying! His first “victims” were awful people—one had been a kidnapper holding an innocent family hostage while the other falls to the Death Note's power while he's assaulting a woman on the street. 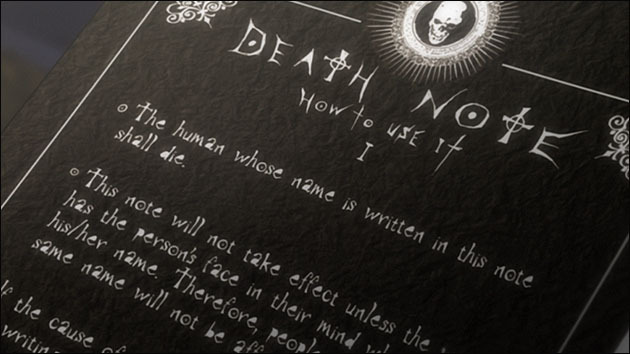 And Light only wrote their names down on a whim to see if the Death Note actually worked. Depending on how you look at it, the god-complex that he develops afterward seems to be as much his way of rationalizing those two deaths as it is a vehicle to the "perfect world" he's trying to make. And Light only gets worse from there; for all his idealistic talk of how wonderful this new world will be, it doesn't take him long at all to start treating everyone around him like pawns to be discarded as needed. 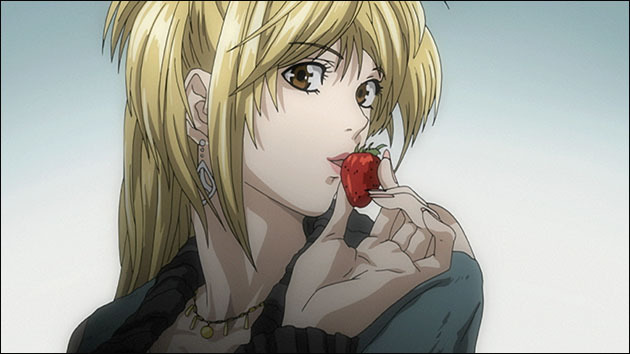 Nor does he ever show regret or question himself after become Kira…which, without giving away too much, is pretty ironic you contrast him with the person he was pre-Death Note. 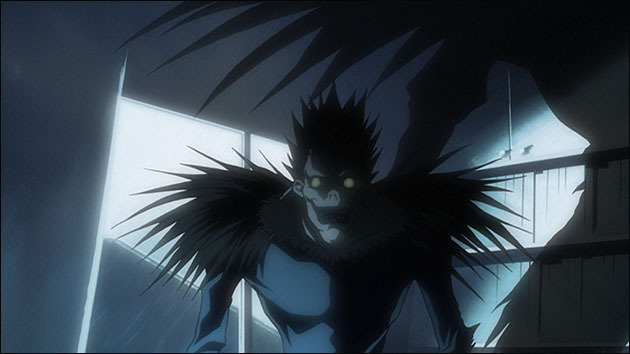 In terms of its visual aesthetic, Death Note's animation is both fluid and high-quality. Which, considering how the series had to mimic Obata Sensei's gorgeous style, is pretty darn impressive. Though of course some episodes got a much higher budget than others, it's less "okay animation vs. good animation" and more "good animation vs. GORGEOUS animation." The Blu-ray only makes it even cleaner and brighter, letting you really drink in the details. Whether you focus in on the various spy gadgets, Light's immaculate haircut, L's many sweets or Misa's... um, frills, it's all in very crisp and stunning. 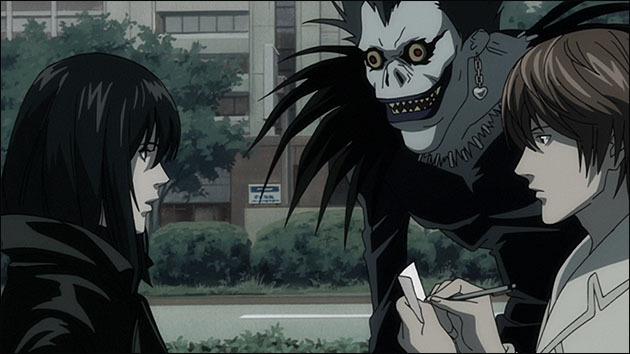 With one of the most groundbreaking plots and character setups (to say nothing of the gorgeous art and direction), Death Note's a special anime. And, with the Omega Version, you can get every last part of it in one package that's never looked better. Now if you'll excuse me, I need to go get a fantastic haircut–the world won't conquer itself, after all! Mwhahaha! You can get this dark and wildly popular anime available on DVD and Blu-ray right here! Special Features: Two feature length films Re-Light 1 & 2, interviews with Japanese creators, behind-the-scenes footage with English and Japanese voice casts, production art, audio commentary, premium finish slipcase with a special booklet featuring the Death Note pilot manga that started it all and more!